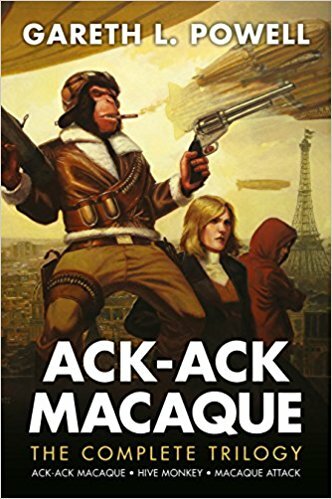 Ack Ack Macaque is a cigar-chomping, gun-toting, foul-mouthed simian Spitfire pilot protecting Britain from invading hordes of Nazis. He’s seen many other pilots come and go, but is so far himself without any injury; when he starts to question this, he discovers he is the min character in a virtual computer game. Meanwhile, in the real world of 2058, heir to the throne Prince Merovech finds himself embroiled in a conspiracy that involves his mother, and the company running the Ack Ack simulation. When he and a group of accomplices pull the plug on the monkey, effectively bringing the now self-aware character into their world, all find they have taken a dangerous step closer to Armageddon. Gareth L Powell’s trilogy is crammed full with ideas – a mix of cyberpunk with a hint of steampunk, he adds parallel universes and shared consciences into the mix with the second book, Hive Monkey – and there’s a danger that concept could outweigh characters here. Fortunately, Powell ensures this doesn’t happen; while each book’s plot reads like that of an action movie, there are many moments of genuine poignancy and sublime characterisation. 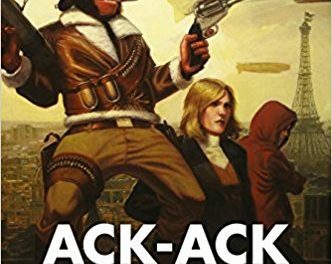 The development of Ack Ack himself – from sweaty simian to someone much more – is particularly well done, but the other characters shine too, making them much more than a supporting cast. While his villains literally do want to take over the world, Powell ensures there’s a motivation behind it which pushes them beyond evil mastermind cliché. Powell’s prose flows and, as the novels progress, there’s the sense of his confidence building, daring to inject these high concepts into the story while never overpowering it. Like the best science-fiction, it can be read as a commentary on important issues: animal experimentation would be the obvious one, but Powell also deals with identity, finding a place in society, and the lengths a person will go to after the loss of a loved one. 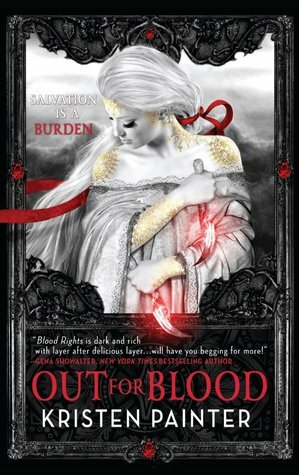 The back cover blurb promises much, and anyone who picks this up won’t be disappointed, as the trilogy delivers so much more besides. Powell juggles everything with great skill and aplomb, the story never faltering, enfolding the reader in the worlds he has created to ensure this is an addictive read from start to finish. A shorter length – these aren’t massive epic tomes, despite the array of ideas they present – ensures that Ack Ack and his crew never outstay their welcome, while maintaining the focus of the plot. If there’s a criticism, it’s slight. 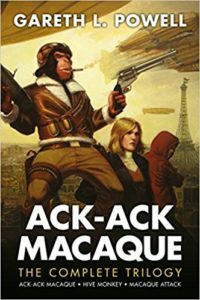 There’s a segment in the final book, Macaque Attack, when we’re taken to the world of Powell’s novel The Recollection and, while it eventually ties in well with the overall plot, it’s initially jarring and potentially confusing, although very entertaining. This omnibus also includes the original short story, first published in Interzone magazine, along with an updated ending exclusive to this edition, making it a fine package indeed. Overall, this is the fantastic romp it would initially appear to be; readers are sure to be entertained, but also intrigued and fascinated by the sheer range and depth that Powell has to offer within these pages.